Ashrafi Mahal: Ashrafi Mahal is one of the famous structures in the fort. Ashrafi Mahal is also known as the Palace of Gold Coins. 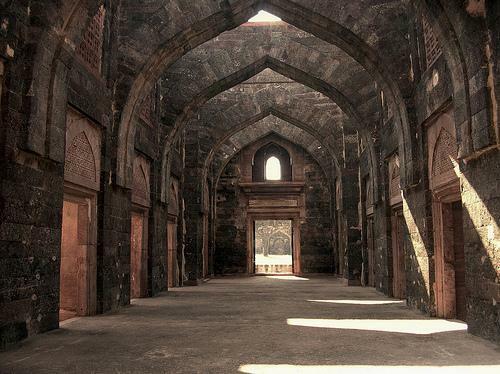 Ashrafi Mahal was built by Mohammed Shah Khilji, who was the successor of Hoshang Shah, one of the Mogul Conquerors. Earlier Ashrafi Mahal was planned to be built as a Muslim Religious School (Madrassa) but later it was just constructed as a palace which went famous to become Mohammed Shah's Tomb. Unfortunately due to its weak foundation and low quality construction work, today what are left is just the ruins which one can see. Jama Masjid: Jama Masjid forms one of the prominent structures of the Fort. Jama Masjid is a huge mosque which was probably built in the year 1454. The architecture of Jama Masjid is a great example of Afghani Style Architecture. The modeling of Jama Masjid is said to have been inspired from the original artworks of Omayyed Mosque located in Damascus. A huge Dome dominates the center with many small domes intervening side spaces. The Jama Masjid is open for Public only for a selected time. Hoshang's Tomb: Hoshang's Tomb is located just next to the Jama Masjid. Hoshang's Tomb is one of the finest examples of ancient Marble Works in India. Hoshang's Tomb was constructed in the year 1435 and most of the designing resembles to that of the Hindu Karigiri in which jail (marble lattice work) finds dominancy. It is also said that the double-domed structure of Hoshang's Tomb was an inspiration for Shahjahan while constructing Taj Mahal and in fact he had sent his men to Hoshang's Tomb for a complete study of this fine piece of architecture. Jain Temple: Jain Temple in the fort is the last monument one could find in the Village Group. The Jain Temple of Fort is a huge complex of several buildings devoted to the Jain Thirthankaras. One can also find a Jain Museum with this Complex. There are huge idols of Jain Thirthankaras placed all over the Jain Temple. All these idols are made in Marble, gold and silver and are intricately decorate. The Jain Museum also has a Theme Park which comprises of a Walk-on Replica of Palitana. Hathi Pol: Hathi Pol which means an Elephant Gate forms the main entrance of the Royal Enclave. The Hathi Pol is a huge entrance with two elephants flanking it. Around the gate there are bastions and guardrooms which are placed in a conventional manner. There are 2 wells right beside the entrance, one of them has a domed centerpiece and the other has arcades all over it. 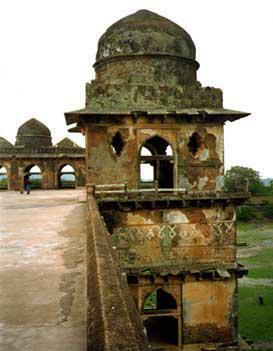 Hindola Mahal: Hindola Mahal means the Swinging Palace. The structure is called so because of its sloping sidewalls and an austere simplicity. The Hindola Palace is done up with delicate stone tracery and has a pleasure dome which gives out a great impression. Champa Baoli: Champa Baoli is one of the interesting structures within the Royal Enclave with a Step-well which was used as a hot-weather retreat and features cool wells or bathrooms. Champa Baoli is called so because it was said that the waters from this well smelled like the Champak Flower. There is a hot bath reserve made at the side for the winters. Jahaz Mahal: Jahaz Mahal or the Ship Palace is one of the most fantastic structures of this Fort. The Jahaz Mahal is one of the most favorite retreats among the tourists today and used to be a favorite retreat for the Sultans of Malwa then too. The Jahaz Mahal was built in the 15th Century and it resembled the shape of a Ship. The Jahaz Mahal was constructed between two lakes namely Munj Talao and the Kapur Talao. This gave it an impression as if the Jahaz Mahal floated in the water like a ship. Taveli Mahal: Taveli Mahal once was a guard house and also housed stables for the Royal family. But now it has been revamped into a Archaeological Survey of India's Antiquity Gallery, which is worth seeing. This gallery exhibits some of the rarest valuables which were recovered from these sites at the Fort. Palace of Baz Bahadur: The Palace of Baz Bahadur is a fantastic blend of Mughal style architecture and Rajasthani Style Architecture. Baz Bahadur was one of the most famous legendary kings known in Indian History. According to the folklore, Baz Bahadur was deeply in love with Rani Roopmati. Baz Bahadur was the independent king of Malwa. 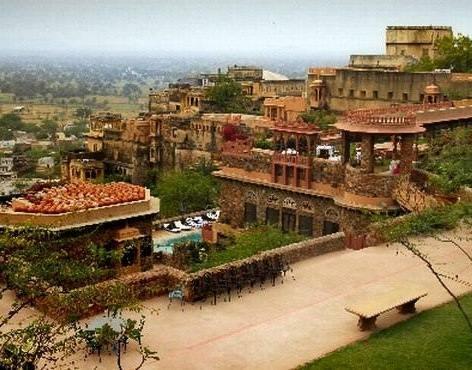 The palace of Baz Bahadur is a must see point at the Rewa Kund Group of the the fort. Pavilion of Raani Roopmati: The Pavilion of Rani Roopmati can be seen located at the periphery of the the fort. The Pavilion of Rani Roopmati resembles the fairytale settings of a perfect romantic structure which manages to fascinate the visitors with its fantastic architecture. The Pavilion of Rani Roopmati offers a breathtaking view of sunset. Additionally there are few other structures which one can have a look when visiting the Fort at this City. These structures include Neelkanth Palace, Darya Khan's Tomb, Hathi Mahal, Dai ka Mahal, Dai ki Choti Bahan ka Mahal, Jali Mahal and the Malik Mughit's Mosque.